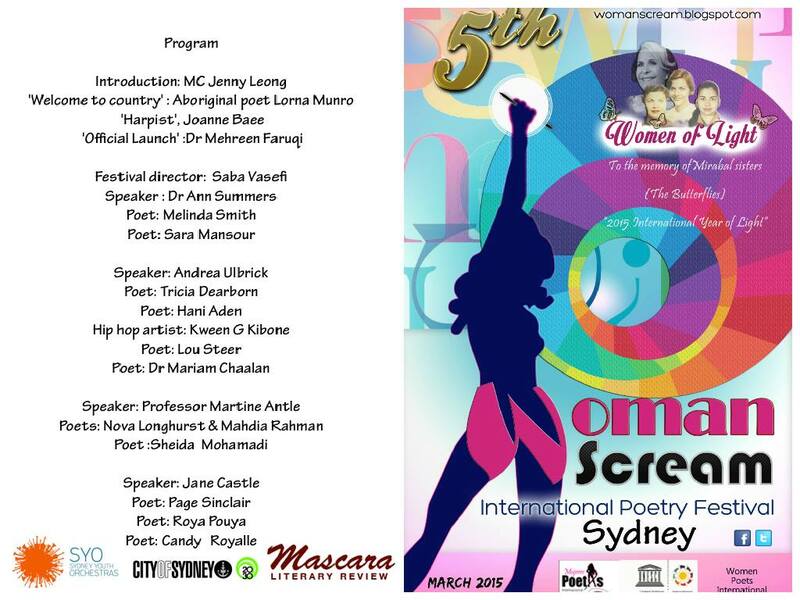 The Second Sydney International Women’s Poetry Festival. Treasury Room Sydney Town Hall, Friday 6 March 2015, 6.30-10pm. On 6 March a significant event will take place in Sydney’s Town Hall – the Second Sydney International Women’s Poetry Festival. The Festival is part of a global chain of events celebrating International Women’s Day in over forty countries worldwide, and has been officially named one of UNESCO’s 2015 International Year of Light activities. The role of women in history, society and culture is underrepresented or devalued. In many instances, the contribution of women is only recognised and appreciated when viewed as subordinate to the role of men. Cultural patterns of discrimination are intersectional; the marginalisation of women functions in a system that involves race, class, gender, sexuality, ability, ethnicity and age. Contemporary female artists must navigate through interconnected systems of oppression. The literature … of women… is the literature of resistance. As festival director, Saba has ensured that established – as well as emerging – poets and artists will be represented. Well known poets such as Melinda Smith, Tricia Dearborn and Candy Royalle will perform alongside lesser known, but highly respected, poets such Sara Mansour, Hani Aden and Roya Pouya. In addition, the audience will be treated to musical performances and film presentations, as well as to speeches by the likes of leading feminist and journalist Dr Ann Summers, and noted politician Dr Mehreen Faruqi, among others. This is a creative rebellion against the forces that abuse and displace women … My awareness of this matrix of oppression, and the complexity of humiliating structures that support it, motivated me to organise this event in Sydney. I have witnessed discrimination towards different cultures, social classes and other marginalised groups… As a Middle Eastern woman I am pleased to create an opportunity for myself and other women with different voices, from different cultures and with different sexual preferences to scream against violence and once more display our power and unity. The Festival will be attended by some refugee women and their children, who will be released especially from detention for the evening, and all proceeds from ticket sales will go to the Bridge For Asylum Seekers Foundation.. This entry was posted in Issue 13, Michele Seminara, Saba Vasefi, The Second Sydney International Women’s Poetry Festival and tagged Australian poetry, Australian Womens' writing, poetry, Poetry Festival, Saba Vasefi, Women's Poetry by Mark Roberts. Bookmark the permalink. Reblogged this on Woman Scream International Poetry Festival.